The time has come when the large and traditional enterprises brace for a challenging future. They must take a queue from the digitally-born companies that do transformation for a living and allocate 100% of their resources to this cause. Digital is no longer an add-on. It must have been, if you haven’t yet embraced it, a core of your business to successfully steer forward and ensuring that your business remains relevant. The point is now how one can embark upon the next rung of digital transformation to get future-ready and address organizational challenges such as– delivering greater customer experience, enhancing product/service quality and stave off cyber security attacks. Digital transformation initiatives let modern organizations to leverage upon modern digital technologies to fundamentally transform the way they run their business and operate through different business processes. There is a lot of talk about consulting engagements that an organization can get to jumpstart its digital transformation initiatives and harvest the benefits from improvised customer centric business processes over cutting-edge digital technologies. However, what is uniquely interesting is to see as to which program will eventually deliver the throughput as organizations invest in these transformation initiatives. “The Digital Enterprise Era applies to each aspect of life in different formats including governance, entertainment, lifestyle, payments, commerce, and banking is no stranger to it. 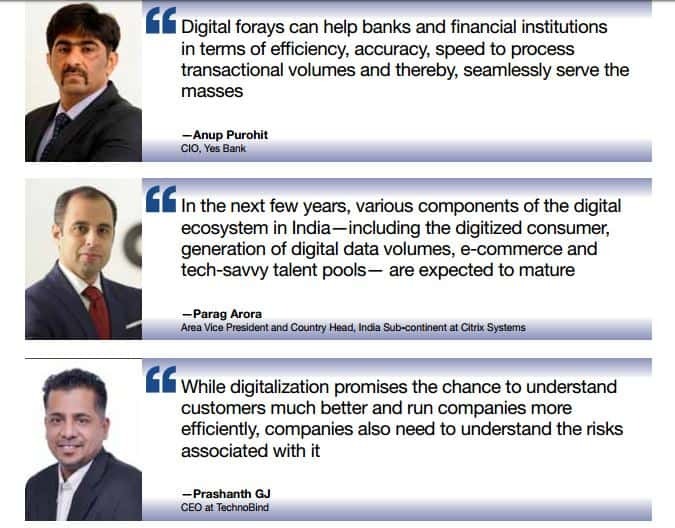 Digital forays can help banks and financial institutions in terms of efficiency, accuracy, speed to process transactional volumes and thereby, seamlessly serve the masses,” explains Anup Purohit, CIO, Yes Bank. The last decade has seen organizations develop their digital profiles: exploring e-commerce; hiring chief digital officers; launching apps and starting ‘incubator’ programmes. These efforts were aimed at adding digital features to a business. Now, digital is moving from an add-on to being central to any organization, presenting a massive opportunity for those able to adapt in time. “In the next few years, various components of the digital ecosystem in India—including the digitized consumer, generation of digital data volumes, e-commerce and tech-savvy talent pools— are expected to mature. Digitalization is therefore a near-term strategic imperative for large businesses in India,” says Parag Arora, Area Vice President & Country Head, India Sub-continent at Citrix Systems. “While digitalization promises the chance to understand customers much better and run companies more efficiently, companies also need to understand the risks associated with it,” warns Prashanth GJ, CEO at TechnoBind. 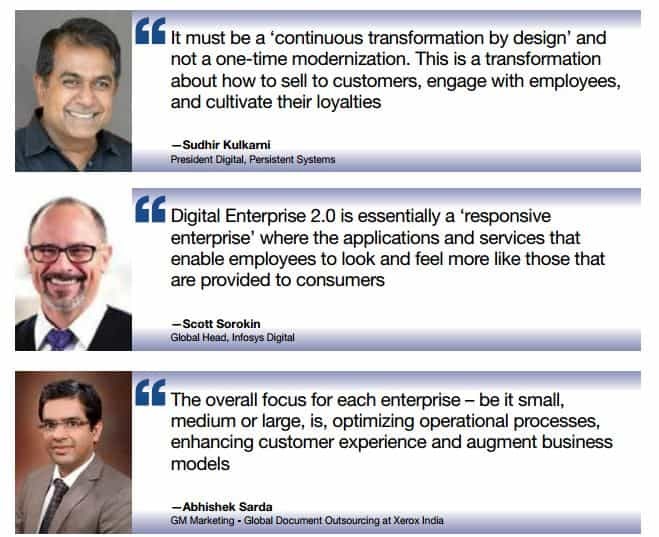 Digital Enterprise 2.0 is the continuous transformation and evolution of their digital strategy. “It must be a ‘continuous transformation by design’ and not a one-time modernization. It is about continuously crafting new lights, not just keeping the lights on. It is a transformation about how to sell to customers, engage with employees, and cultivate their loyalties,” says Sudhir Kulkarni, President Digital, Persistent Systems. Digitalization makes up for multiple components that majorly constitute cloud, mobility, social and analytics. While it is a huge market opportunity for IT companies and solution providers, it is a time for organizations and businesses to evaluate their viability and plan their digital investments. Plus, the proliferation of mobile devices in India (close to 350 million smartphones) and social media users (300 million) are forcing companies, startups to innovate. There is no single opinion on the market size for digitalization. Many reports say many things. Given the pace at which all of this mushrooming, it is believed that digitalization IT spend can grow between 20% and 40% on an average in the country. There is one report (marketsandmarkets.com) which estimates the digital transformation market to reach $369.22 bn by 2020, at a Compound Annual Growth Rate (CAGR) of 19.6%. Sorokin emphasizes that Enterprise 2.0 is not hype. It captures the need for the professional and the consumer to come together as one with two distinctive sides to them, driven by the shift from enterprise-grade technology to consumer-grade, which is much closer to the concept of platform thinking. “Digitalization has a different kind of impact on different enterprises; each will have its own pace of transformation owing to the complexity of the business. However, the overall focus for each enterprise – be it small, medium or large, optimizing operational processes, enhancing customer experience and augment business models,” says Abhishek Sarda, GM Marketing – Global Document Outsourcing at Xerox India. “The whole world is a stage, really for digitalization. The disruption caused by digitalization could be so profound that the entire industry landscape could get redrawn! For instance, Airbnb allows individual home/property owners to rent out a portion of their home to customers, and this potentially can hugely dent the traditional hotel industry,” suggests Jagadish Iyengar, VP and Head, Digital Transformation Services, Sasken Communication Technologies. Iyengar further underlines the change brought by new age startup Uber which is disrupting the traditional taxi/ limousine services business. Growth rates for these disruptions can be dizzy in the hundreds of percent at the height of the disruption. In the overall digitalization movement, the role of banking sector has been exemplary mainly because of the regulatory framework and intense competition. “The BFSI segment accounted for the largest market share during 2014 and is expected to reach $53 bn by the end of the forecast period. As the products and services offered by banks are becoming digitized, this sector is seeing substantial investments in digital capabilities such as social media, mobile payments, and big data analytics,” adds Purohit of Yes Bank. For instance, many banking and financial firms such as Bandhan and IDFC, etc are executing on their digital capabilities and leveraging current assets to improve customer segmentation and provide better offerings to targeted customers. While Netflix, Uber, Airbnb and Amazon, etc have globally done this, Ola, Oyo Rooms, Byju’s Classes, Flipkart and PayTM, etc have done it locally. “With the digitalization, most of the companies are racing to migrate ‘analog’ approaches to customers, products, services, and operating models to an always-on, real-time, and information-rich marketplace,” shares Anoop Pai Dhungat, Chairman & Managing Director at Galaxy Office Automation. He further underlines that industry leaders are redesigning the capabilities and operating models to take full advantage of digital technologies and is creating qualitatively new business models around disruptive digital opportunities. This helps them not only secure and continued relevance but superior returns also. 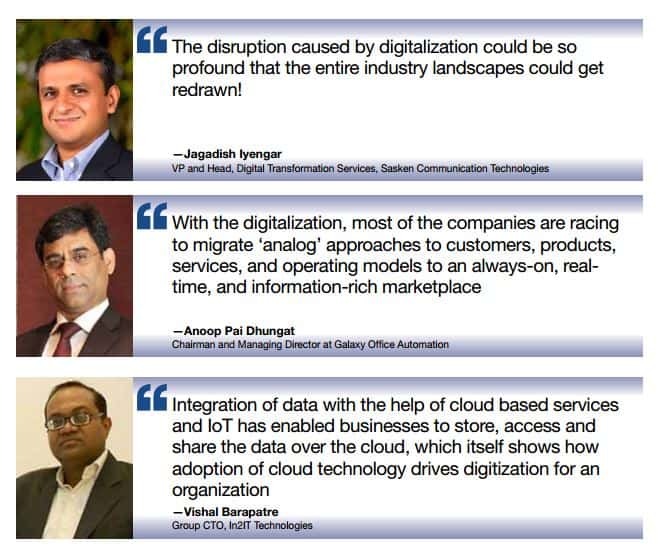 “Integration of data with the help of cloud-based services and Internet of Things (IoT) has enabled businesses to store, access and share data over the cloud, which itself shows how adoption of cloud technology drives digitization for an organization,” argues Vishal Barapatre, Group CTO, In2IT Technologies. If a study conducted by PwC is to be believed, by the year 2020, an entire generation will have grown up in a primarily digital world. Their familiarity with technology, reliance on mobile communications, and desire to remain in contact with large networks of contacts will transform how we work and how we consume. In other words, the meaning of digital enterprise will continue to evolve, transform and change as the user behavior changes. It urgently calls for rapid and flexible processes at organizations as they will not have any breather in near time. Hence current scenario suggests a progress beyond simply embracing SMAC technologies. It is believed that enterprises today have begun to realize the full potential and merits of IoT, data analytics and smart connectivity which symbolizes a second generation of digital enterprise technologies. “Advancement in technology yesterday was with the introduction of internet and computing, which graduated to software technology like cloud computing. 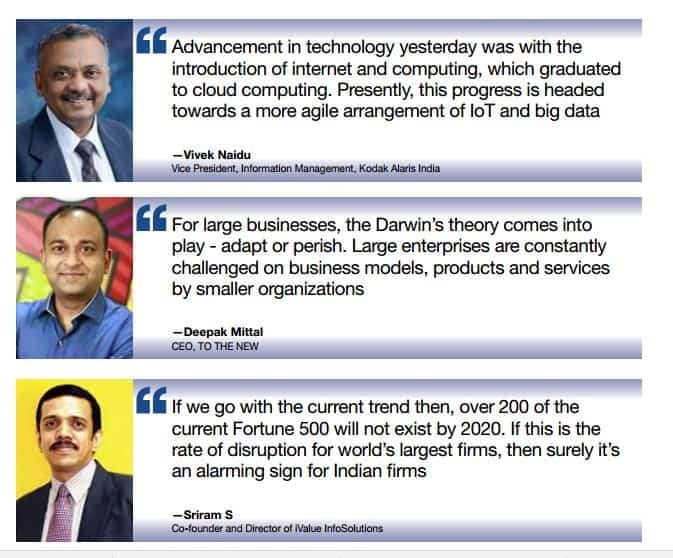 Presently, this progress is headed towards a more agile arrangement of IoT and big data,” believes Vivek Naidu, Vice President, Information Management, Kodak Alaris India. There is no doubt that the digital revolution has come as a boon for the small and mid-sized businesses. With democratization of technology, small and mid-sized businesses are able to control it to create and innovate with new products, services and business models. They have taught large companies to constantly innovate and “Being small also allows SMB players to be nimble and adapt more easily to external changes as compared to the large enterprises. For large businesses, the Darwin’s theory comes into play – adapt or perish. Large enterprises are constantly challenged on business models, products and services by smaller organizations,” says Deepak Mittal, CEO, TO THE NEW. Digital disruption has threatened the existence of many traditional enterprises. Chances are high that many of them may be extinct tomorrow or in the near future. “Digital disruption is for real, and is here to stay. Being an outside-in force driven by market and new customer behavior trends, there is no denying to the fact that we see disruption all around us,” agrees Arun Nathani, CEO and MD, Cybage. The advent and rapid acceptance of smartphones and social media has brought big disruptive changes. “If we go with the current trend then, over 200 of the current Fortune 500 will not exist by 2020. If this is the rate of disruption for world’s largest firms, then surely it’s an alarming sign for Indian firms and they should come up with an action plan. How you do is more important than what you do… Digital way of doing is the best way forward,” says Sriram S, Co-founder and Director of iValue InfoSolutions. How can organizations avert their extinction? Perhaps keeping themselves aligned to the technology needs that make them future-ready is the only way in sight. This is a good time from ecosystem perspective – cloud, big data, social media, mobility, talent-pool and customer/consumer mindset. 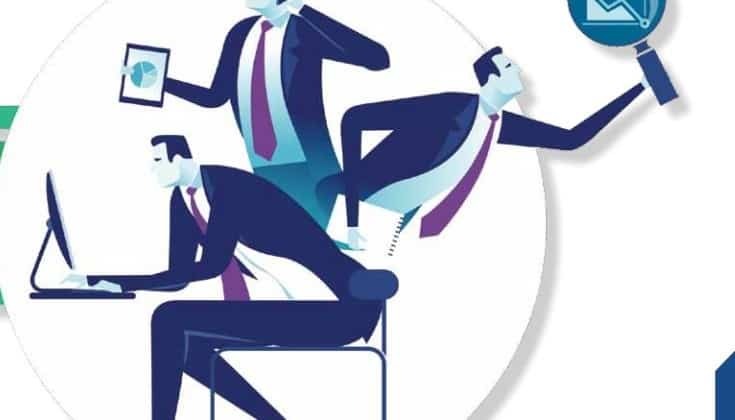 Maybe this is the reason that in the second part of their journey, companies have moved further and started outlining as well as creating new digital roles, such as Chief Data Scientists or Chief Digital Officers (CDO). Now organizations are taking inspiration from startups and going extra miles in hiring people beyond their industries. HSBC’s CDO is from Google, Argos’ from eBay, to give a few examples. Hiring people from outside the loop gives organizations an upper hand and helps them understand the technology in far better way. According to an expert, these roles are catalysts though, rather than a long-term solution, and should be understood as transitional. Organizations have begun to embark upon the ‘Platform Thinking’. “Platform Thinking is a business model that uses the infrastructure of the digital age to enable new products and services focused on combining capabilities and creating platforms upon which enterprises can re-imagine their businesses. Companies that are making the shift to responsive digital enterprises are already seeing returns in cost savings, efficiency, speed-to-market and real-time engagement with their customers,” further opines Sorokin. In this new connected world, disruptive forces are coming from all directions and enterprises must be prepared for competition, not just from known peers but also from next-generation born-digital companies. These fresh start-ups are not encumbered by physical legacy constraints or a mindset that limits how they see the world. They do things differently. They listen to customer requirements, experiment and are set-up for continuous delivery, seamless integration and are able to respond rapidly with actionable intelligence. One of the important risks is ‘how do we allocate resources’ to drive success of digital transformation. “For the success of digital transformation, there has to be skewed allocation of resources in favor of digital initiatives- disproportionally different from IT modernization. If we are serious about success of digital transformation- we have to allocate resources. Such allocation has a cost risk but the rewards outlive the risks by a long way,” further advises Kulkarni of Persistent Systems. Enterprises can brace for their next race in the digital space. At first, enterprises need to understand the exact IT requirements for their businesses to grow at a faster pace while moving ahead on improving the business ecosystem. Secondly, enterprises should approach an enterprise technology consultant who rules the area of expertise and provides them the best advice that can help them to solve complex business problems. At the same time, ability to handle and counter cyber security is going to be determining factor for success in the digital space. Every organization is different and so does have different requirements and investment capabilities. It’s important to identify where the company is lacking behind and how it can make the effective use of cutting-edge technology. Digital Transformation 2.0: From Hype to Reality 0 out of 5 based on 0 ratings. 0 user reviews.